As Samford University’s annual International Education Week wrapped up, Director of Global Engagement Lauren Doss enjoyed seeing the amount of diversity that was represented at various events throughout the week. “The students wrote down action items from [Face to Face with Race], and I was so encouraged to read all the ways in which they plan to continue that difficult conversation,” Doss said. Throughout the week, students at Samford had the unique opportunity to learn about the world from fellow students. During one of the highlights of the week, Monday’s Face to Face with Race, students discussed answers to tough questions about race such as “What does cultural diversity look like where you are from?” Students’ home countries included Rwanda, China, India and Australia. One resolution from Face to Face was that the media portrays race relations to be worse than they are. In fact, as one table discussed, most people realize that deep down humans are the same: eyes to see, hears to hear and a heart that beats. Of course, these people are not the ones who are making headlines. 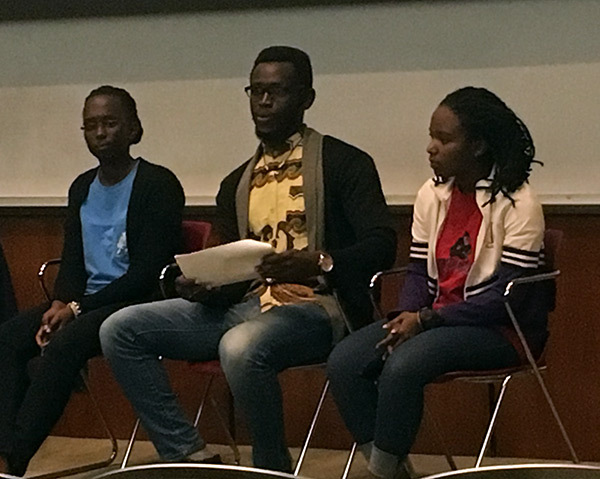 In another session, two students from Rwanda and one from Burundi talked about their home countries, how they became a part of the Bridge2Rwanda program and lessons the world can learn from Africa. Sophomore Joyeuse Senga encouraged students to take a gap year. During Senga’s gap year, she was able to be more focused and academically challenged to prepare for Samford. Senga is driven to make a difference. “I say to myself, ‘Hey, you need to go to class; Africa’s narrative needs you,’” Senga said. She has the Rwandan flag on the ceiling in her dorm room to inspire her and remind her why she is at Samford. Freshman Christa Bella Bizimana is from Burundi, a neighboring country of Rwanda in East Africa. She compared the United States to Burundi using the analogy of a house. “The United States is like a finished house,” Bizimana said. “Burundi doesn’t even have a foundation.” She uses this thought to remind her of her goals in life: to go back and help her country. “I hope students learned the value of a different perspective and the need to push themselves beyond their comfort zone in order to learn and grow,” Doss said.